Welcome to the Hey Canada! blog tour as it stops off in Japan! I wonder if we are the farthest stop on the blog tour away from Canada? Check out all the other participants on the Hey Canada! 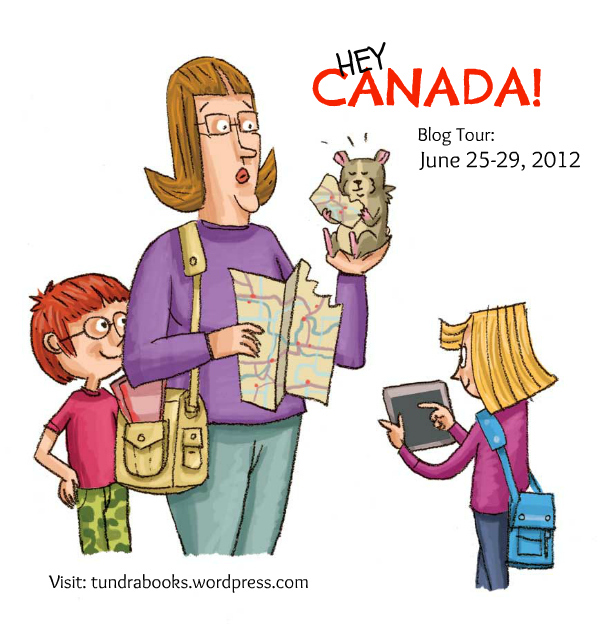 blog tour on Tundra Books' blog! Hey Canada! is a fantastic resource for kids, written by Vivien Bowers and illustrated by Milan Pavlovic, and published by Tundra Books. When I say resource I know that some of your eyes are glazing over, but I can tell you, that doesn't mean boring! Gran takes her grandkids, Alice and Cal, and their hamster on a cross-country tour. Cal and Alice find out a lot about Canada and share that with us through comics, tweets, and even hamster updates! It's enjoyable to visit the Biodome and the Ogopogo with this offbeat family! 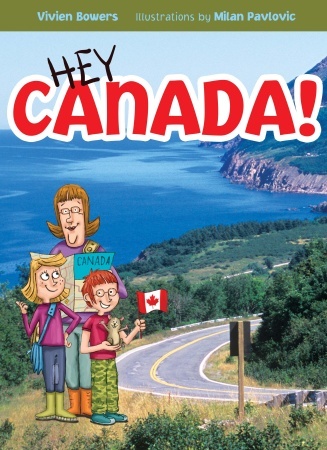 I'm sure that the main audience for this book is Canadian kids in Canada, but for my Canadian kids outside of Canada it is fantastic as it got them excited to go to Canada and find all these cool places! So important for us. It's a really good introduction to the vastness and diversity of my home country. I think this would be a perfect book for kids and teens who are going to Canada for a homestay or a school trip. I hope this is in Canadian embassy libraries and waiting rooms around the world. I was very lucky to interview author Viven Bowers for my stop on the blog tour. Read on! What inspired you to write a fictional book about Canadian geography for kids, rather than nonfiction? Interesting question, because Hey Canada! is still considered a 'non-fiction' book, even though the facts and information are presented through a fictional story. It's similar to other non-fiction books such as the "Magic Schoolbus" series for kids. I agree, though - the line between fiction and non-fiction is rather blurred. I use the fictional story to reel in the kids. They want to know what Cal will tweet next, or whether the escaping hamster will be found. Also, when I include fictional characters, I can have them respond to things they see or do just like real could would, such as Cal knowing the names of the dinosaurs, or Alice being confused between Vancouver and Vancouver Island. My fictional kids ask the questions that real readers might have. Have you been to all of the provinces and territories in your book? Yes, I visited them all while researching a previous book called Wow Canada! And now, I'm often invited to do school and library author tours in different parts of the country (I was in Manitoba in May for a TD Children's Book Week Tour) so that's another opportunity to get acquainted with the country. But here's an admission - I have never been to Iqaluit on Baffin Island. I was in Cambridge Bay, so I can say that I've visited Nunavut, but I haven't been anywhere in Nunavut other than Cambridge Bay. If you could choose only one of these places to write an extended fictional book spin-off (Gran, Cal, and Alice rent a cottage in _____ for the summer!) where would you choose? How about Haida Gwaii (Queen Charlotte Islands)? I think it has lots of potential for good plot lines - wild storms and crashing waves, shipwrecked boats, whales, bear encounters and soaring eagles, kayak trips, Haida culture and ancient forests... I've spent a couple of weeks there each summer for the past few years, and it always seems dramatically misty and mysterious. The only drawback is that the water is darned cold for swimming. If you were to suggest a short itinerary to a kid visiting Canada from abroad, what 3 experiences and what 3 foods would you suggest? Well, it has to include dinosaurs, so we'll start with the Tyrrel Museum at Drumheller and a dig at Dinosaur Provincial Park. And we have to go to the Rockies, to see wildlife and maybe tromp about on a real glacier. Kids love poking about on beaches, so we could fly to a spot on the west coast where there are lots of sea stars, anemones, and other marine intertidal critters. Or a long sandy beach with breakers crashing in. As for food: smoked salmon on the west coast, wild huckleberries growing high in the mountains of BC or Alberta, and pancakes with maple syrup from Quebec. Do hamsters really travel that well? We traveled with a hamster one summer holiday when I was a kid, and it escaped, so that's where I got the idea for bringing along the hamster in the book. Also, when I ask kids in Grade 3 what they like to read about, they always mention animals. I suspect that, really, hamsters are better left at home with a neighbour. Someplace wild and scenic. At the time this posting appears, in fact, I'll be camping and canoeing through remote islands off the west coast of BC. If it's sunny and not too windy, it'll be a dream vacation. If the weather is miserable, it will be awful. I also wouldn't mind drinking wine and eating local cheese in a small village in the mountains of northern Italy, bathed in late afternoon light. What was your favourite book as a kid? Has it influenced your writing? I loved those series written by English authors such as Enid Blyton or Arthur Ransome, where the kids got involved in all sorts of outdoor adventures and usually parents were nowhere in sight. Not always great literature, but I gobbled them up. I'd love to try writing something similar with modern kids in a Canadian context. The biggest influences on my writing, though, were probably the Magic Schoolbus series and, especially, Bill Waterston's Calvin and Hobbes cartoons. My kids loved that mix of wit, cleverness, and slightly outrageous sarcasm – and so did I. We read them a LOT. Even though my two boys have now grown, I still write for the kids that they used to be. I wish I were multilingual, and admire anyone who can function well in a language other than their mother tongue, let alone blog! Even my French is absolutely pathetic. I'm not sure what you mean by "stuff it up," but I'm sure you don't do it, not at all. Your kids are blessed to have a multicultural heritage. Does Cal have a twitter account we can follow, or are his tweets exclusive to the book? Yes, he does, follow him here. Thanks so much for answering my questions! Now I want to go to Iqaluit and eat huckleberries! Want a chance to win a copy of Hey Canada? Retweet one of Cal's factoids with the hashtag #heycanada. Couldn't be easier!